Solid Capture has a wonderful feature called Scrolling Window Capture. It allows you to capture an entire web page as a single image. Unfortunately, this feature is only available in Internet Explorer and not Firefox. So what are our customers who prefer using Firefox over IE left to do (besides use IE)? One good workaround we've found is using IE Tab to view Internet Explorer inside of a tab in Firefox. You can then use Solid Capture to take a screen shot of the IE tab in Firefox. When you're done taking the screen shot you can change the tab back to Firefox and keep working. At the time of this writing the latest version of the add-on that works with Firefox 2 is 1.3.3.20070528 (try saying that five times fast). You can download it from here. The product is a little short on instructions, but it isn't hard to use. When you're at a page that you want to view in IE, click the IE Tab button on your toolbar to switch to IE. When you want to switch the tab back, click the IE Tab button again. It may install itself automatically for people, but when we tested it we didn't see any extra buttons appear on our navigation toolbar like it does in the above image. We were able to add it by going into Firefox | View | Toolbars | Customize. Click and drag the IE Tab button to your toolbar of choice to place the button. 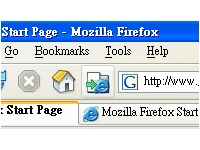 You can click the IE Tab button whenever you need to open a page in Firefox in Internet Explorer.